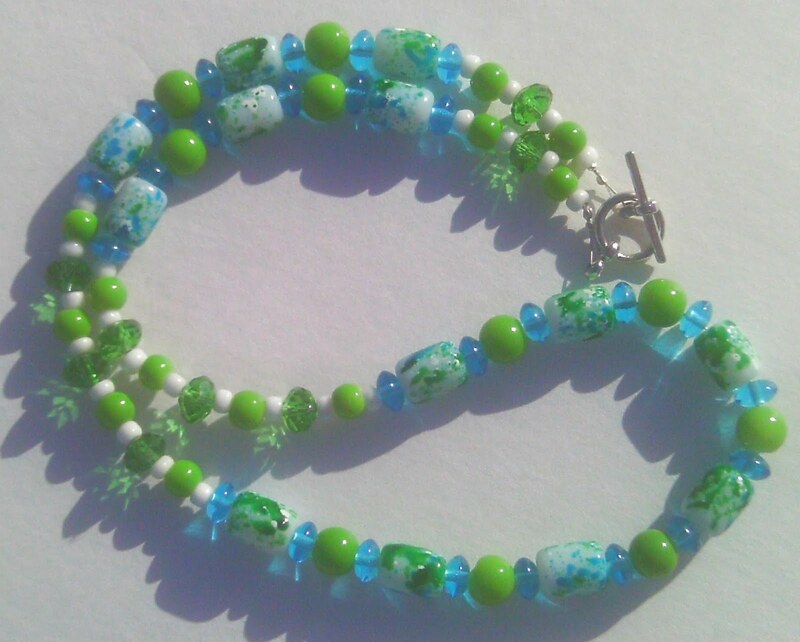 Walked into one of my fave discount stores and there was a bin full of $1 beads. 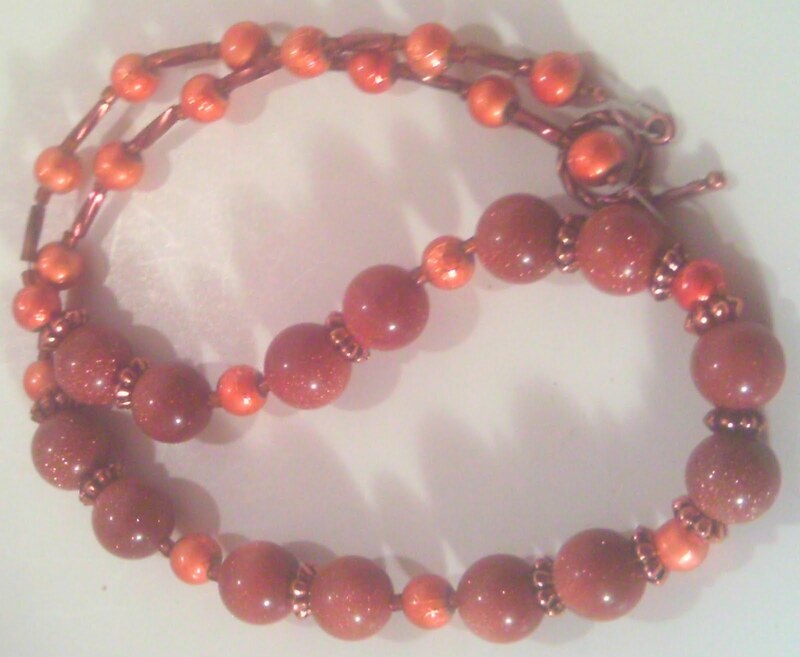 Found these brown goldstone beads and the small metal rust colored beads. Used some of those beads along with some copper spacers, some twisted bugle beads and a copper toggle clasp and here it is! 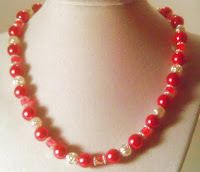 4 Necklaces added to my showroom today! 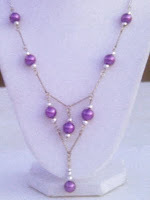 Along with the 5 new pair of earrings, I also added 4 new necklaces today. 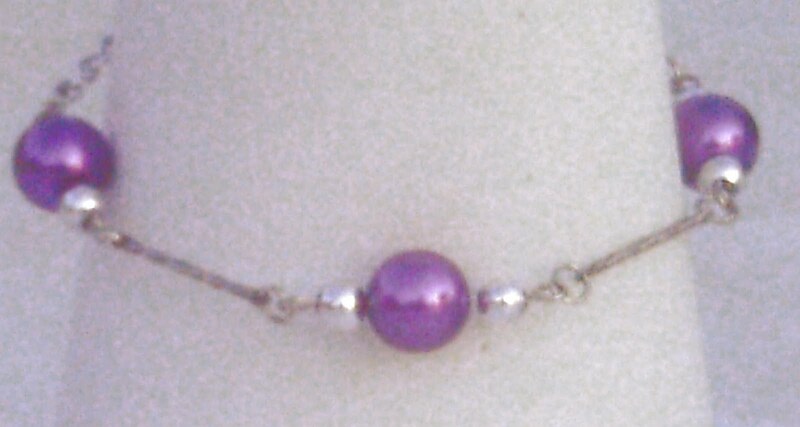 The first two are floating type necklaces. 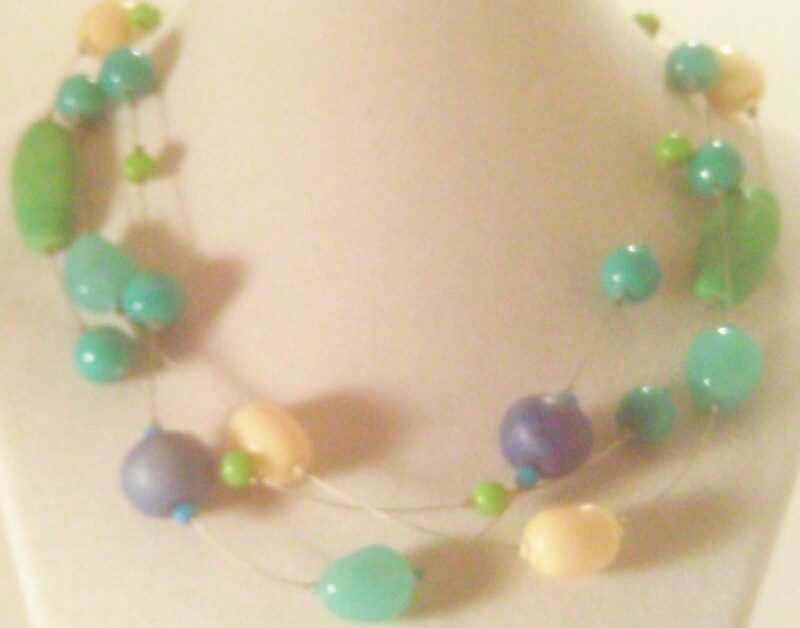 The first is called "Colors of the Sea" which consists of assorted gemstone and glass beads in the colors of the sea. 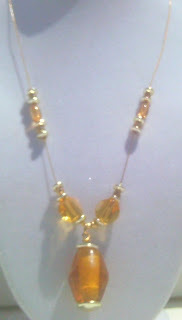 The second is called "Floating Amber" which features some beautiful translucent amber beads. The next necklace I call "Gothic Butterfly". 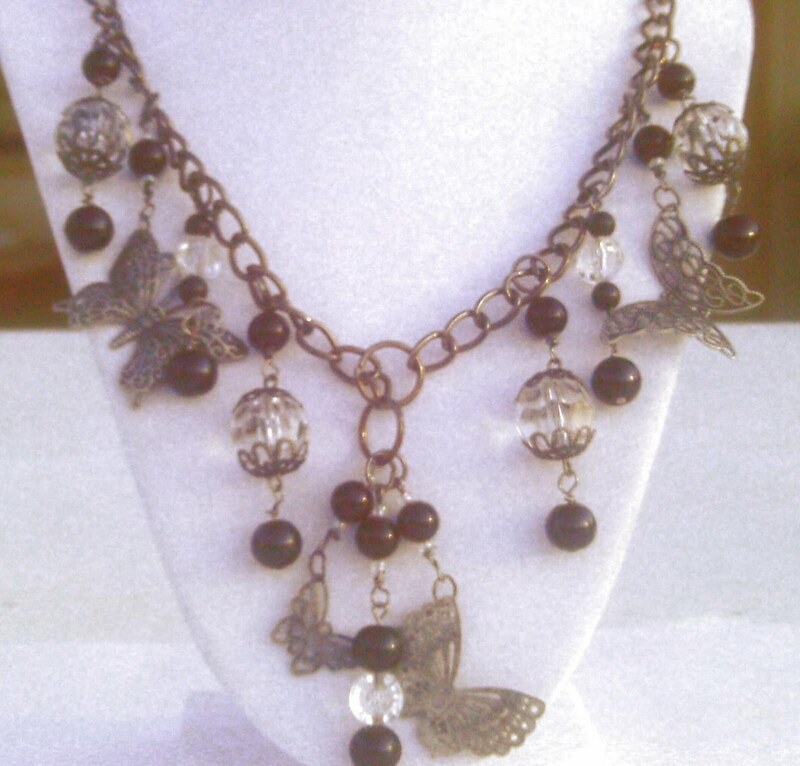 This is a chunky 'lariat style' necklace with large gun metal chain, 5 filigree butterflies, large crystals with filigree bead caps, black pearl type glass beads and a black agate gemstone dangle. 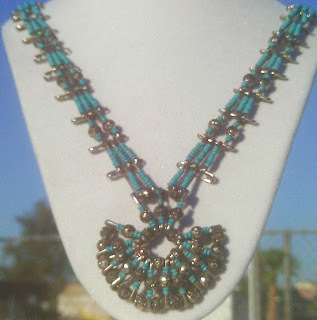 The final necklace is called "Old-Fashioned Indian". 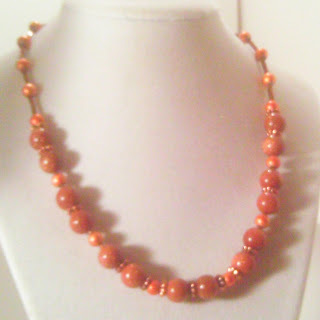 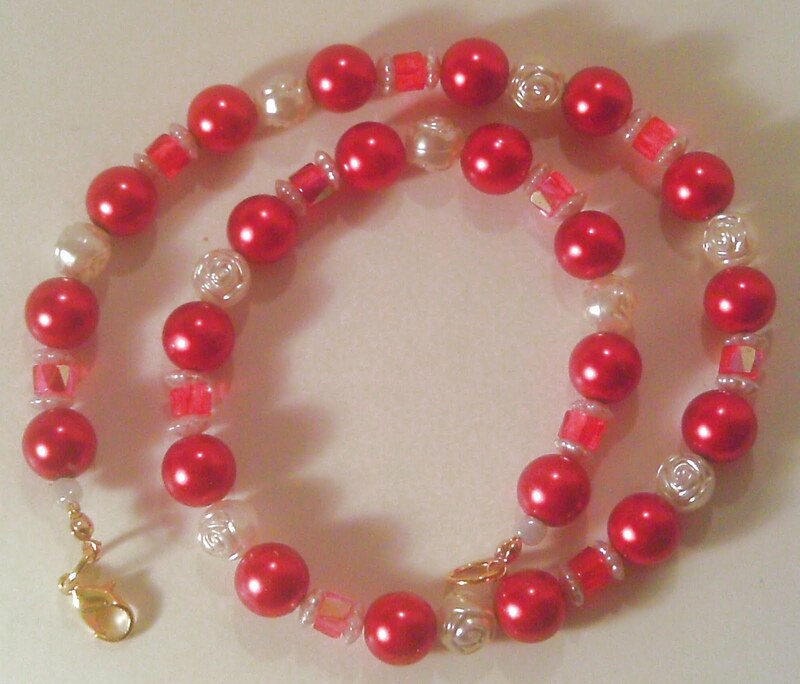 I call it old fashioned because this type of necklace was popular during the '70s. Some of you may remember them well. 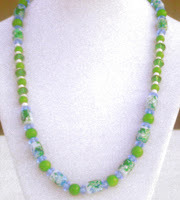 The necklace is made out of silver rose beads, turquoise seed beads and lots and lots of safety pins. The focal of the necklace resembles an Indian headdress. 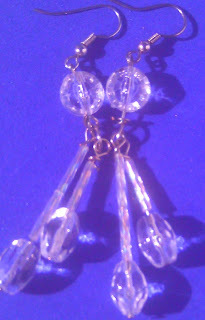 5 new earrings added to my showroom today! 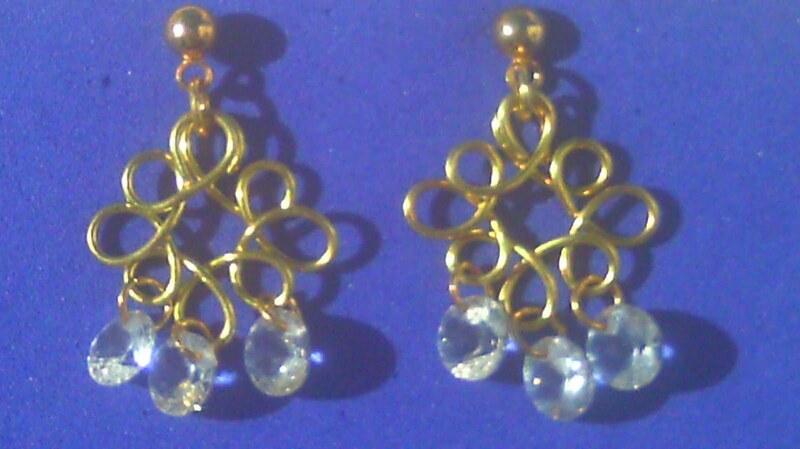 I added 5 pair of earrings today. 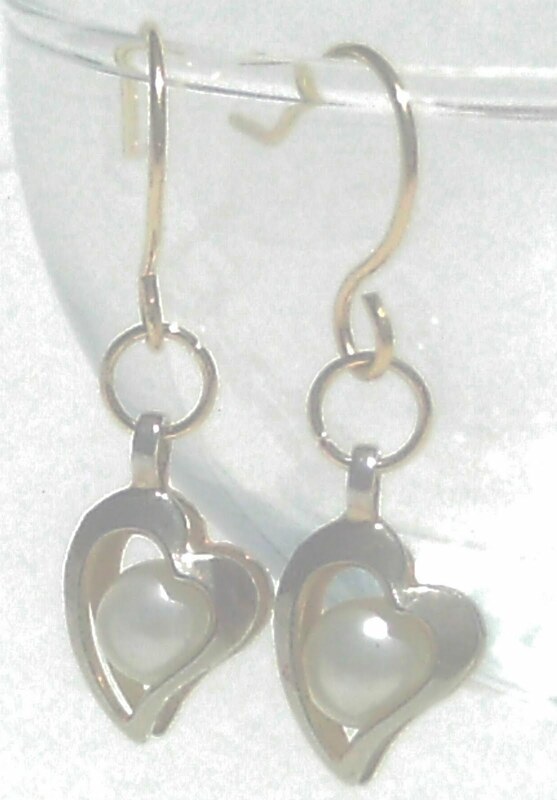 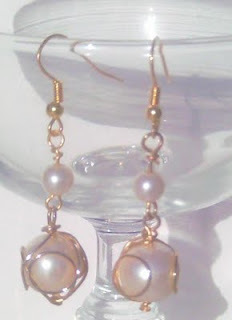 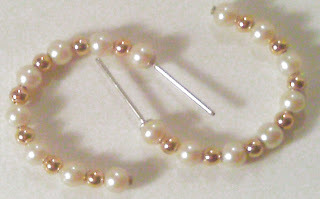 First are 3 pair of pear earrings; Some pearl hoops, some wire wrapped pearl dangles and some heart framed pearls. 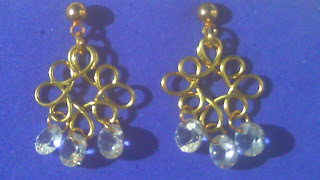 Here's six pair of earrings being added to my store tonight. All six are made using clear crystals. 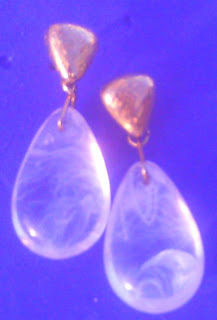 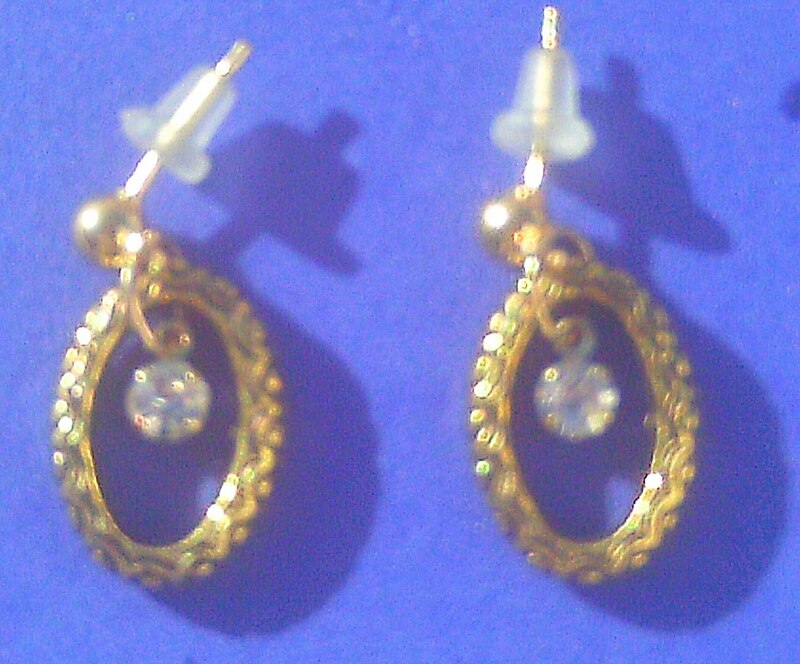 The first pair of earrings have a 3D cloud effect, the second pair have two rondelle crystals and a drop crystal with jagged edges, the third pair have bi-cone crystals and twisted bugle beads, the fourth pair have wire wrapped crystals and twisted bugle beads, the fifth pair have oval crystals, coin crystals and twisted bugle beads and the sixth pair were made with rondelle crystals. 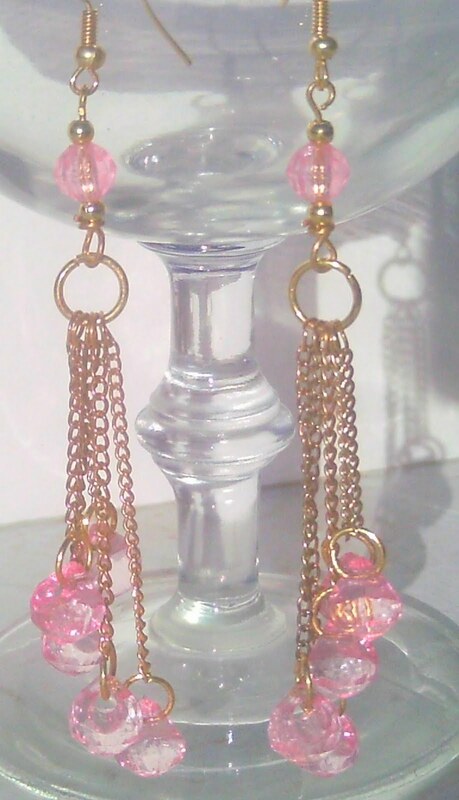 Well, I love pink (and tons of other colors, lol) But I do like pink a lot and seem to have tons off beads in pink and so another pair of pink earrings. 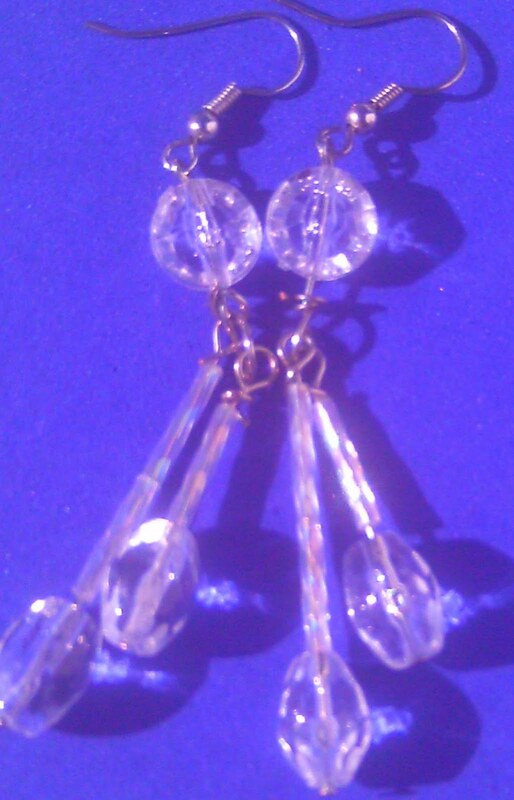 These are pretty long, too 4" to be exact. This next pair of earrings are ..... not pink, lol. 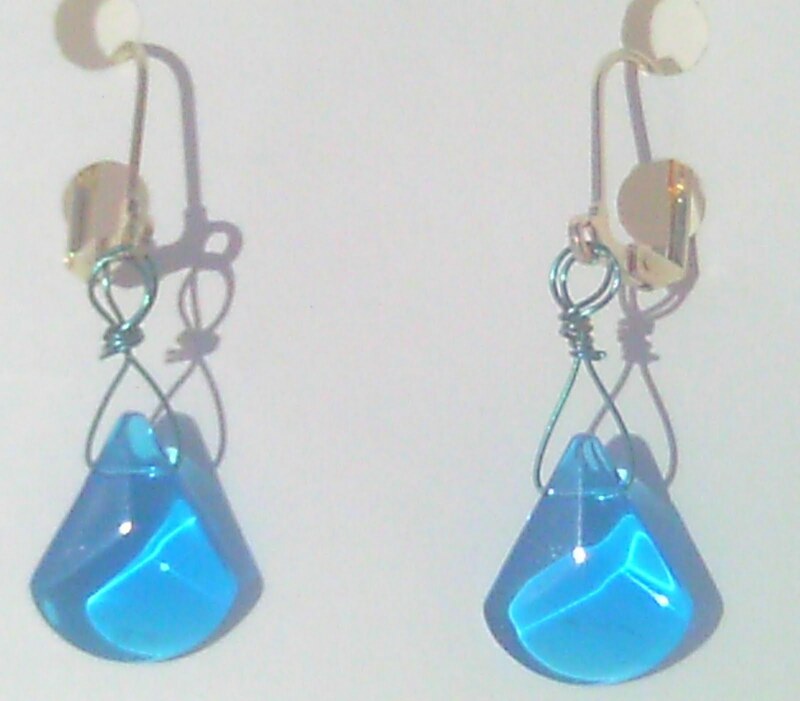 These are blue and very simple. 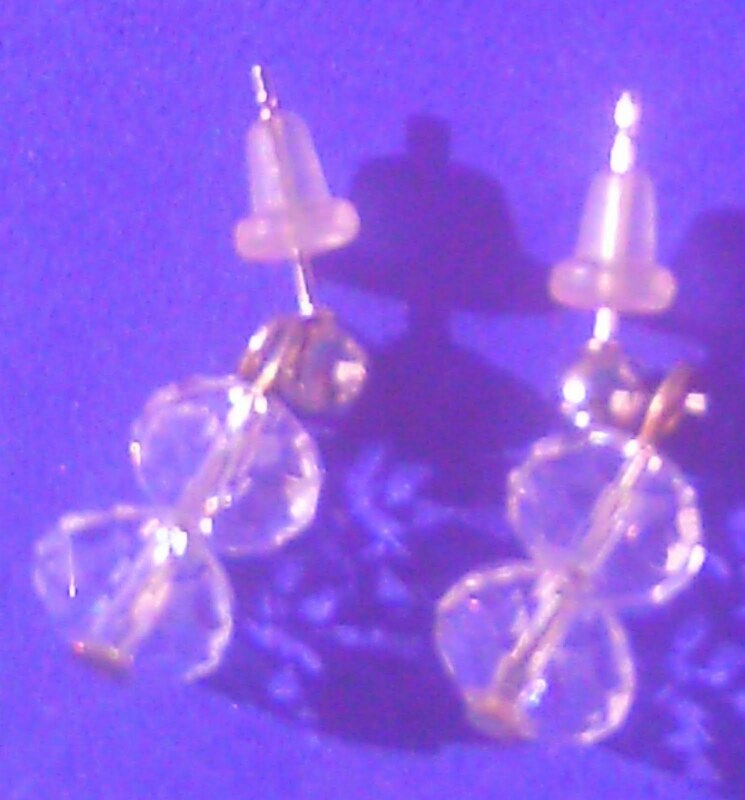 I call them Single Drop of Rain. 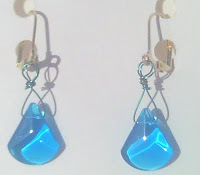 They are a simple blue teardrop bead attached to the lever back earwire with a wrap of blue wire. 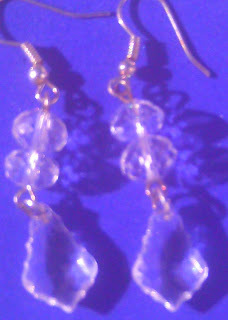 Ok.....taking pics outdoors now......turning out much better. 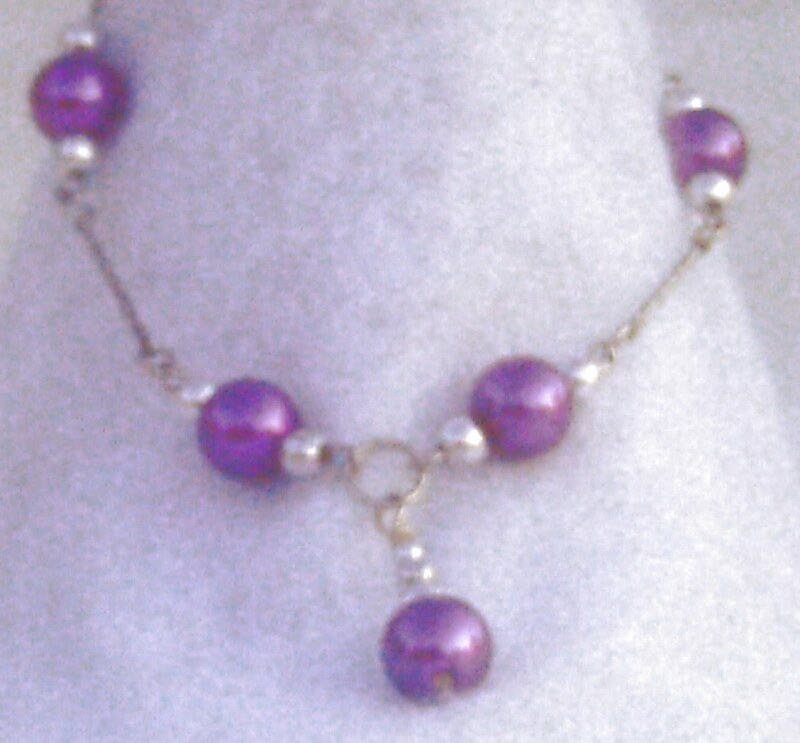 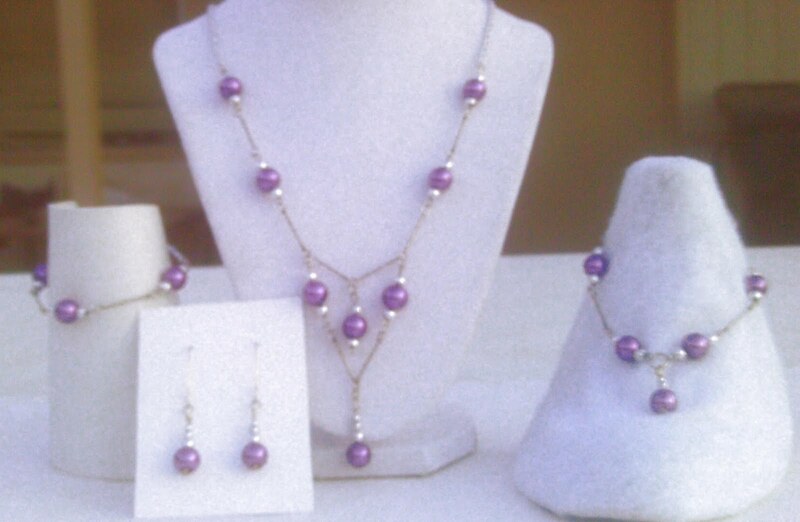 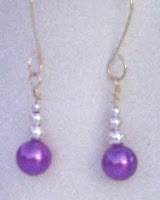 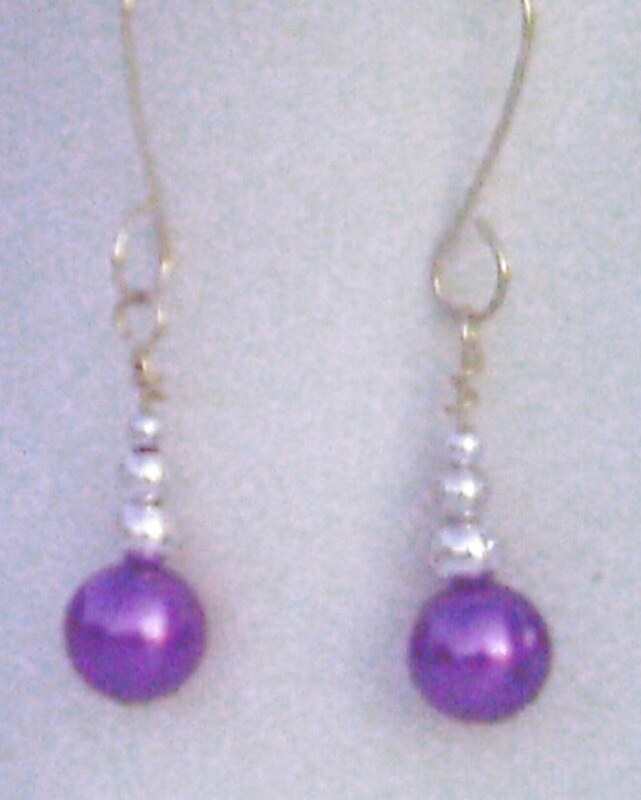 New pics of the Purple Haze Jewelry Set. Necklace, Earrings, Bracelet, and Anklet. This next one I call Splattered, looks like it's been splattered with paint! 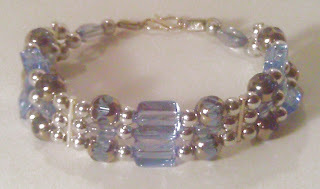 For some reason, I don't get too many ideas for bracelets, so bracelets are what I have the least of. Today, however, I had a design pop into my head and here it is, I call it Blue Horizon. 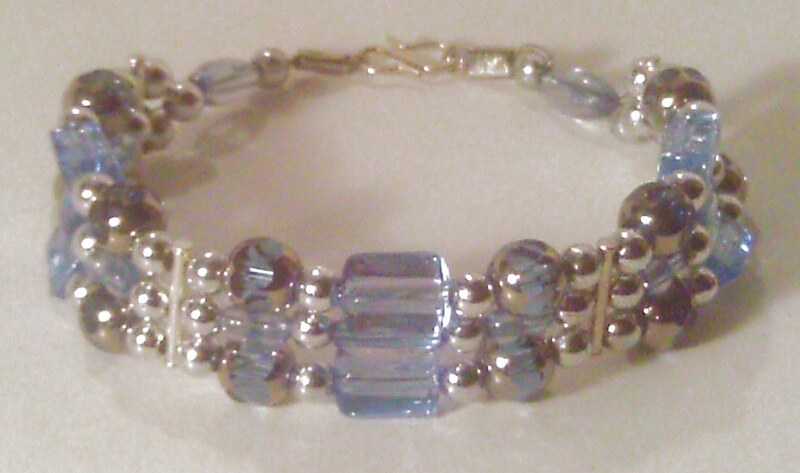 It was created using 3 hole spacer tube beads, blue and silver cathedral beads, blue rectangular and oval beads and round silver beads. This is my first time using ribbon in jewelry making. I am not too sure if I like it or not. 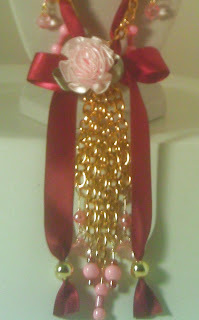 I think it might look a little too much like gift wrapping. Burgundy always reminds me of a romantic glass of wine which is why I called this piece Dinner and Romance.